Natural Gas Fracking: More Trouble Than It's Worth? 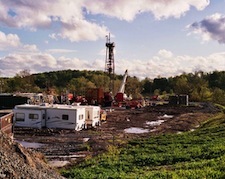 Hydraulic fracturing or “fracking” has been associated with water contamination, global warming-causing air pollution, health problems, falling property values and even earthquakes. Each year fracking pumps billions of gallons of water and chemicals deep underground under high pressure to force open cracks and release natural gas. According to the House Energy and Commerce Committee, the chemicals used in fracking fluids include over 750 different chemicals. Some are innocuouse (salt, gelatin) while others pose significant human health hazards (methanol, isopropanol and 2-butoxyethanol). About 650 of the 750 chemicals used in fracking operations are known carcinogens, according to the report filed with the U.S. House of Representatives in April 2011. They include toxic chemicals like benzene and tholuene. Returning fracking fluids are referred to as “flowback” and in addition to chemical additives, they can include many naturally occurring substances that pose hazards, including methane, heavy metals like barium and radioactive matter. Fracking can unlock 2,552 trillion cubic feet of natural gas in the U.S., which is enough to power the country for more than a century. However, there are some serious problems with natural gas fracking as well as natural gas itself. Although natural gas burns cleaner than other fossil fuels (combustion of natural gas releases less carbon dioxide per BTU than combustion of either coal or gasoline), when all things considered, natural gas is not cleaner than other fossil fuels and may even be worse. According to American Rivers, fracking threatens rivers and streams that provide clean drinking water, habitat for fish and wildlife, and recreational opportunities, such as fishing and boating. Many of America’s greatest rivers are under threat from natural gas development. They include the Upper Delaware, Susquehanna, Monongahela, and Hoback Rivers. A PNAS study found that drinking wells near the Marcellus Shale contained 17 times as much methane as those half a mile away. Part of the problem is that natural gas development enjoys exemptions from keystone environmental laws, such as the Safe Drinking Water Act and the Clean Water Act. “Unchecked by adequate safeguards, natural gas production has the potential to pollute clean water for millions of people. We have already experienced instances of surface and groundwater pollution, air pollution, soil contamination, habitat fragmentation, and erosion from extracting gas from shale using fracking,” American Rivers said. While it is widely suspected that natural gas fracking pollutes waterways, it is becoming increasingly apparent that the practice can also cause earthquakes. According to scientists with the U.S. Geological Survey (USGS), the oil and gas industry is “almost certainly” responsible for the earthquakes in the U.S. Midwest. The midsection of America is a relatively quiet geologically zone, but in 2009 USGS seismologist Bill Ellsworth noticed a dramatic increase in the number of quakes in this area. Ellsworth and his colleagues watched the number of quakes go from an average of 20 tremors a year to more 50 in 2009, 87 in 2010 and 134 last year. Ellsworth’s closer inspection revealed that many of the new quakes were clustering around the wastewater wells, which are very deep holes where companies dump the frack water once it has been used. As reported in the Washington Post, another problem with fracking is the fact that it inevitably causes methane to escape into the atmosphere. Methane is a potent greenhouse gas, it is more than 20 times the heat trapping capacity of carbon dioxide. Modeling studies have suggested that if more than 2 percent of the methane from natural-gas production escapes out into the air, then natural gas may not offer much of a climate advantage over coal. The EPA pegs the leakage rate at around 2 percent, but a study from Cornell’s Robert Howarth suggests that the leakage rate could be as high as 7.8 percent. An NOAA study estimated the methane leakage at around 4 percent, but this study did not include inevitable leaks from distribution pipelines. In addition to contributing to global warming , the air pollution associated with fracking also endangers human health. A Texas hospital serving six counties near drilling sites reported asthma rates three times higher than the state average; one-quarter of young children in the community had asthma. Opponents to fracking point to numerous cases of health problems such as headaches, nosebleeds and rashes in humans, and reproductive problems in livestock in areas of the country with heavy gas-drilling activity. Gas companies are using state legislatures to push ahead with an agenda that destroys the environment and endangers public health. In at least two states it is now illegal for medical professionals to report the human health effects from fracking. On May 15, the Ohio State Senate approved legislation that would prevent physicians from sharing information about patients’ exposure to hydrofracking chemicals (the oil and gas industry has given hundreds thousands of dollars to the Ohio General Assembly to help secure this support). Gas companies have also resisted efforts to find out about the toxic chemicals used in fracking. A new Pennsylvania law forbids health care professionals from sharing information they learn about certain chemicals and procedures used in fracking. France banned fracking in July 2011, followed by South Africa in August 2011 and most recently Bulgaria did the same. In Canada, the province of Quebec has banned fracking and now Quebec’s neighbors in Vermont have followed suit. Vermont is the first U.S. state where fracking is now illegal. On May 4, 2012, Vermont Governor Peter Shumlin signed a statewide hydraulic-fracturing ban into law. The town of Dryden, N.Y., won a court ruling saying it could prohibit natural gas fracking as part of its zoning ordinance. State environmental officials in New York placed a moratorium on fracking while they come up with new regulations to cover oil and gas drilling in the underground geological deposits. Now that New York’s courts have given municipalities the power to ban fracking within their borders, environmentalists are pushing Governor Andrew Cuomo to outlaw the practice altogether. In Michigan, citizens are pushing for a ballot initiative to amend the state’s constitution to ban horizontal hydraulic fracturing statewide. The proposed amendment would also ban the storage of wastes from horizontal hydraulic fracturing. At a press conference on May 15, an inclusive group of citizens called for a ban on fracking, in California. Already, 50,000 Californians have signed CREDO Action petitions that supports a ban on fracking in that state. Other American states and Canadian provinces are also rallying to ban fracking along with people in countries around the world. “The grassroots are tens of thousands of people using their vacation days to go to rallies, spending their savings to get the word out, and going door-to-door getting thousands of signatures on petitions,” said Sue Rapp of Vestal Residents for Safe Energy, a local group in Broome County. The combination of air pollution, water contamination, earthquakes, public health issues and falling property values make fracking a less than attractive option. Please read my story on WKYC Monica Robins Facebook.